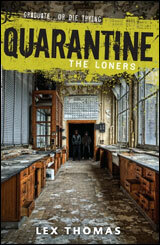 In this debut novel from Lex Thomas (Lex Hrabe and Thomas Voorhies), you find yourself in McKinley High School, under quarantine. I was entranced from page one with this book. It is thought provoking and action packed. You will find violence in the book, so if that’s something you’re not into then pass on this book….or better yet….just pass those parts so you can still enjoy rest of the book! David and his brother Will are just trying to survive. They was enough food to get by and a safe place to sleep at night. With the gangs that have formed (Varsity, Geeks, Sluts, etc) they only have each other to depend on. The novel was very well written and the storyline has a good pace to it. The characters are developed, and although David is the main character, you also get to read the perspective of some of the other characters that have an important role in the book. The only drawback is waiting on book 2! I think if I had to live with one of the gangs (aside from Loners) I would pick Geeks. They get to live in the school library! What gang do you think you would be with if you were quarantined in your high school? What do you think your biggest asset would be in surviving?